Because there was no room to store the streetcar inside, it stood in the Museum's backyard surrounded by a fence under a shed-roof. When the Museum acquired the East building in 1959, the streetcar was moved inside. The car stayed in the East Building until the "Gaslight Village" annex building and exhibit were created in 1964. 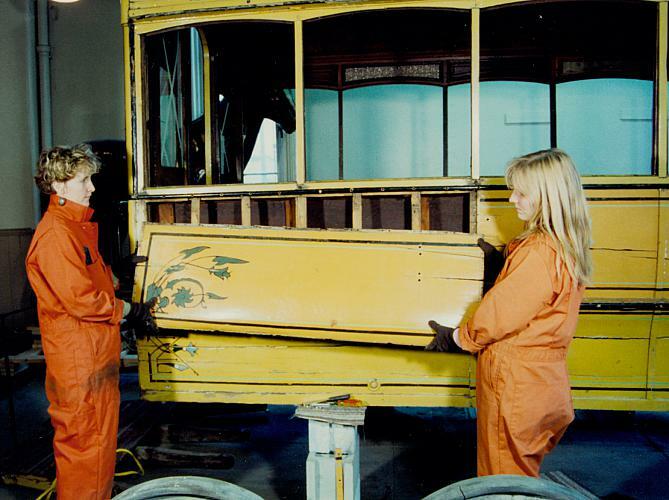 Many Museum visitors enjoyed the streetcar and horse from 1965 until July of 1992 when it was removed in preparation for exhibit in the new Van Andel Museum Center. Twenty-seven years of constant use by visitors had paid their toll. Exhibit Curator Carl Ulanowicz performed a preliminary examination of the streetcar in August 1991 while it was still on exhibit in the "Gaslight Village." As the trolley now stands, all the problems are not readily visible because of lighting conditions. Mr. Ralph Kennedy of Kennedy Furniture & Decorative Arts Conservation was contracted to perform a more thorough examination of the car and provide a written treatment and cost proposal for restoration. 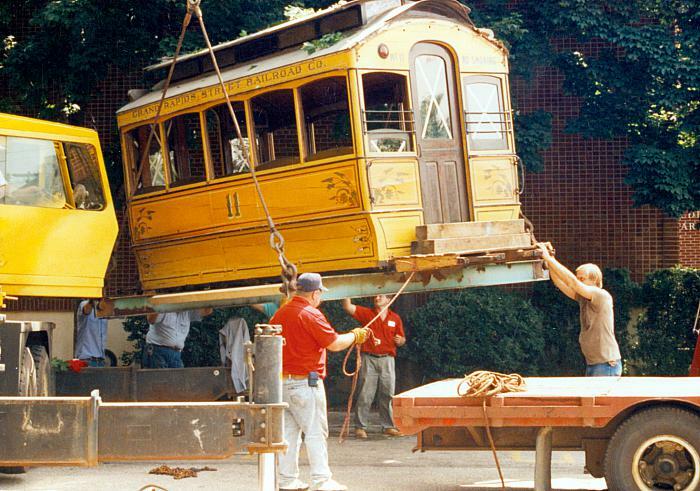 On July 17, 1992 the streetcar and horse were removed from the Gaslight Village building by West Shore Services of Allendale, Michigan. They were moved to Fire House #6 on Grandville Avenue for treatment. A treatment work plan, based on Ralph Kennedy's proposal, was develop by a team of Museum personnel. Following this plan the Exhibit staff commenced work in the fall of 1992. Their first step was through photographic documentation of the streetcar in its present state. The next step was the removal of one side panel to determine the difficulty of removal, any potential negative impact to the car, and the degree of structural work required to stabilize the car. 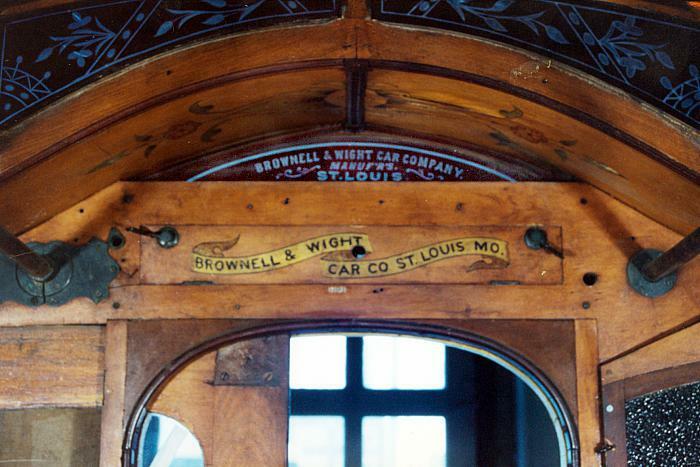 During this work the exhibit staff found the name of the streetcar's manufacturer, Brownell and Wight Car Company, in several places. A ribbon with the name was found above both interior doors, on metal plaques on the doors themselves, and in the etched ruby glass in the roof. Hardware on the interior doors was marked "Brownell & White St. Louis Missouri." They also located a patent date of 1881 on the wheel bearing inspection plates. Concurrent to the structural restoration work, the staff also conducted historical research to find information on the construction and appearance of the car. The St. Louis County Museum of Transportation sent a copy of two primary source references. The first was a book titled the "Car Builders Dictionary" published by the Railroad Gazette of New York in 1881. The second was "The Car-Buyer's Helper," published by the Brownell Car company in 1891. The Missouri Historical Society sent copies of company descriptions that appeared in the book "The City of St. Louis and Its Resources" published in 1893. The selection of paint colors was based several factors. The first was analysis of the paint layers found on several spots of the car. 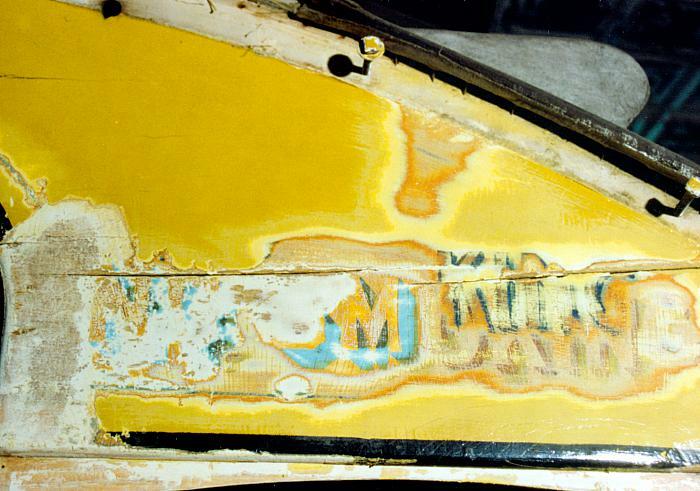 During Mr. Kennedy's examination he found "many paint layers still exist on the car in many places . . . There are numerous places where an older orange colored paint is visible." The second source for determining color choice was the written description of the finishing process and the paint colors, which appeared in the book 1891Brownell Company book "The Car-Buyer's Helper. The major body color was cadmium yellow, with Paris green, vermilion glazed with number 49 carmine and ultramarine blue. 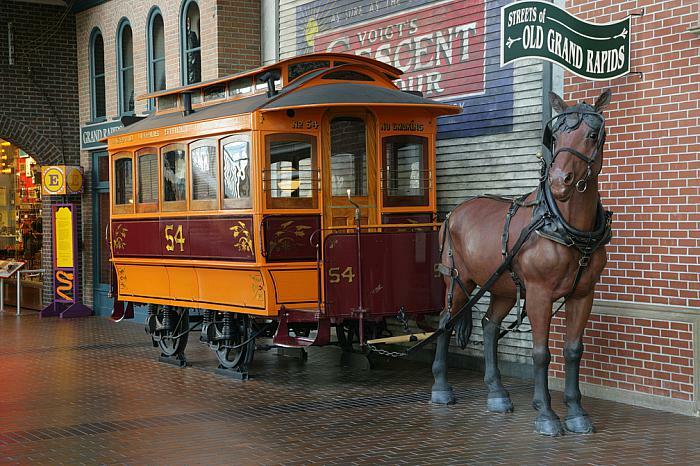 The late 19th century horse drawn street car, used by the Grand Rapids Railway Co., the predecessor to the Motor Coach Co., was retired and stored at the company's Wealthy Street car barns until it was presented to the museum. The restored Grand Rapids Street Railway streetcar stands at the entrance of the "Streets of Old Grand Rapids" exhibit at the Public Museum's riverfront building. Glance at the Past examines the genesis of our GR Public Museum and an early patron, George Wickwire Smith. Like the streets of San Fransisco, Grand Rapids invested time and money towards using cable cars, along with all ready established horse drawn street cars, to climb the steep streets of the city. Eventually cable and horse drawn cars were replaced with their electric counterparts. The White Printing Company’s Street and Railway Service Directory of Grand Rapids, Michigan. Grand Rapids: White Printing Co., 1914. Rowsome, Frank. 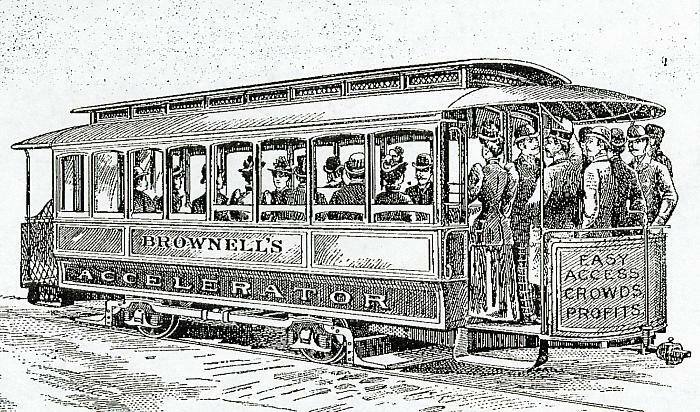 Trolley Car Treasury: A Century of American Streetcars, Horsecars, Cable Cars, Interurbans, and Trolleys. New York: McGraw-Hill, 1956.